A new study calls for the U.S. to step up its laser R&D efforts to better compete with major overseas efforts to build large, high-power laser systems, and notes progress and milestones at the Department of Energy's Berkeley Lab Laser Accelerator (BELLA) Center and other sites. An investment in this so-called "second laser revolution" promises to open up a range of applications, from machining to medicine to particle acceleration, according to the December report by the National Academies of Sciences, Engineering, and Medicine, which offers independent analysis to government agencies and policymakers. The 280-page report, "Opportunities in Intense Ultrafast Lasers: Reaching for the Brightest Light ", recommends increased coordination and collaboration by government labs and agencies, universities, and industry to build up U.S. laser facilities and capabilities. It also recommends that the DOE lead the creation of a national strategy to develop and operate large-scale national laboratory-based laser projects, midscale projects that could potentially be hosted at universities, and a laser tech-transfer program connecting industry, academia, and national labs. The committee that prepared the report visited Berkeley Lab and other Northern California national labs, including SLAC National Accelerator Laboratory and Lawrence Livermore National Laboratory. The committee also visited the Extreme Light Infrastructure Beamlines laser facility site that is underway in the Czech Republic, and the Laboratory for Laser Energetics of the University of Rochester in New York. At the DOE's Lawrence Berkeley National Laboratory (Berkeley Lab), BELLA scientists are working to develop laser-based acceleration techniques that could lead to more compact particle accelerators for high-energy physics and drivers for high-energy light sources; also, the report notes, "laser expertise and utilization" that had been concentrated at other laboratories "is now broadening with plans for utilization of lasers at (Berkeley Lab)" and elsewhere. BELLA has made progress in demonstrating the rapid acceleration of electrons using separate stages of laser-based acceleration by forming and heating plasmas in which a powerful wave is created for electrons to "surf" on. "There's a lot of work that's been done already, and Berkeley Lab has been a key developer for the vision of where things need to go," said Wim Leemans, director of the BELLA Center and the Lab's Accelerator Technology & Applied Physics Division. Berkeley Lab was home to a pioneering experiment)in 2004 that showed laser plasma acceleration can produce relatively narrow energy spread beams – reported in the so-called "Dream Beam" issue of the journal Nature – and in 2006 used a similar laser-driven acceleration technique to accelerate electrons to a then-record energy of 1 billion electron volts, or GeV. That achievement was followed in 2014 by a 4.2 GeV beam, using the powerful new laser that is at the heart of the BELLA Center and will be key to its ongoing campaign for 10 GeV. In 1996, Berkeley Lab also logged the first demonstration of X-ray pulses lasting just quadrillionths of a second with a technique known as "inverse Compton scattering," the report notes. "What industry is seeing is the push toward higher-average-power lasers and ultrafast lasers, and it's starting to impact machining and industrial applications," Leemans said. "That's really good news for us." In laser lingo, average power relates to how much total power the laser puts out over time, counting the pulses and the "off time" between pulses, while the peak power is that of an individual pulse. A rapid-fire rate of high-power pulses gives a laser higher average power and can potentially be applied to a wider range of uses. The National Academies report recommends that U.S. scientific stakeholders should work to define the technical specifications in laser performance goals, such as targets for peak power, repetition rate, length of pulses, and the wavelength of laser light. In 2012 the BELLA Center's laser set a record by delivering a petawatt (quadrillion watts) of power packed into pulses that measured 40 quadrillionths of a second in length and came at a rate of one per second. A new goal is to up this pulse rate to 1,000 per second, or a kilohertz, for a next-gen upgrade dubbed K-BELLA. Producing pulse rates of up to 10,000 or 100,000 per second could make this machine relevant for a new type of laser-based particle accelerator. "There are lots of applications for a k-BELLA-style laser," Leemans said. The vision is for k-BELLA to be a collaborative research facility that would be open to scientists from outside the Lab, he said, which also syncs with the recommendations in the report to foster a more cooperative environment for laser science and scientists. Forging and maintaining connections to other world-class laser centers is also key for the U.S. laser program, the report notes. Another upgrade that may be useful to the U.S. laser program is the addition of a second beamline at BELLA, Leemans said. A second beamline could enable exotic collisions between a beam of light and an electron beam, or between two beams of light. 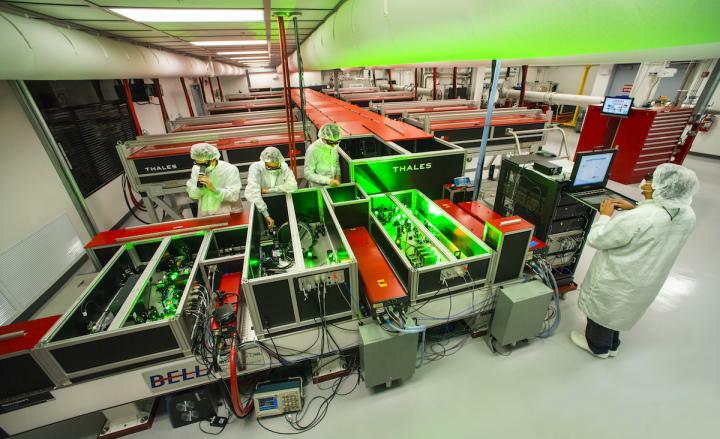 Laser-produced beams of light elements, and laser-produced low-energy electron beams, could also be pursued at BELLA to develop the biomedical basis for new types of medical treatments that better target cancers, for example. "We look forward to enhancing our own laser capabilities at Berkeley Lab while working with our partners to strengthen the nation's laser R&D efforts," said James Symons, associate laboratory director for physical sciences. "Higher average power lasers will be essential for all practical applications of laser plasma accelerators." The National Academies report was sponsored by the U.S. Department of Energy's Office of Science, the National Nuclear Security Administration, the Office of Naval Research, and the Air Force Office of Scientific Research.